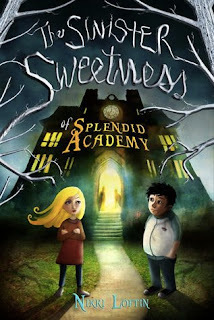 When Lorelei's old school mysteriously burns down, a new one appears practically overnight: Splendid Academy. Rock-climbing walls on the playground and golden bowls of candy on every desk? Gourmet meals in the cafeteria, served by waiters? Optional homework and two recess periods a day? It's every kids's dream. But Lorelei and her new friend Andrew are pretty sure it's too good to be true. Together they uncover a sinister mystery, one with their teacher, the beautiful Ms. Morrigan, at the very center. Then Andrew disappears. Lorelei has to save him, even if that means facing a past she'd like to forget – and taking on a teacher who's a real witch. What Lorelei and Andrew discover chills their bones – and might even pick them clean! This may be a middle grade read, but it is a tale with real bite. It seems as though life has not been going very well for Lorelie Robinson; with the death of her mother, her father's remarriage to "Molly", and her school mysteriously burning down. Just when she thinks that things are strictly downhill, along comes Principal Trapp and Splendid Academy. With a playground straight out of a fairytale and a curriculum that seems to be focused on friends, feeding, and fun rather than reading and writing; you would think that Lorelei would be over the moon. There is something very sinister going on at Splendid Academy, and it's up to Lorelei and her friend Andrew to find out what. This is a cautionary tale that reminds young and old readers alike that "if something seems too good to be true...it probably is". This novel is dripping enough suspense to keep the most grown of 'grown-ups' turning pages for hours. At the same time, the vibrant imagery, kid-friendly writing style and great illustrations will capture the hearts and minds of younger readers. One of the things that sets this book apart from the pack in terms of stories aimed at a mid-grade audience is the fact that there are no clearly BAD characters in this read. There are characters who do bad things, but the reasons for their actions are explained, leaving the reader to make the final judgement as to the overall goodness or badness of the person in question. The exploration of character motive at the mid-grade level is a wonderful change from the status quo of spoon fed black and white plots. Throughout this tale, Lorelei and the reader are encouraged to trust their feelings about situations rather than going with the flow. This is an excellent story of friendship, forgiveness, self-reliance, intelligence, and the transcendent power of love. The cover at is so cute, the little boy with the potbelly is so adorable LOL. This book sounds like Goosebumps and Are You Afraid of the Dark. I used to love those as a kid. I love the cover. My first thought is a retake on Hansel and Gretel, but it sounds more sophisticated than that. Thanks for the revu!